If a pet is ever lost and is handed in at a veterinary clinic or animal shelter, a microchip scanner is passed over the animal to reveal the unique 15-number code. The vet or animal shelter can then refer to the database to identify the name, address and phone number of the owner, so they can be reunited with their pet. 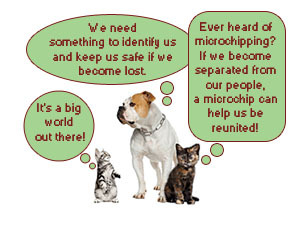 A microchip is about the size of a small grain of rice, and is injected under your pet’s skin. It can be done during a normal consultation. A microchip is the most effective form of permanent identification. This code is kept on a central computer database, accessible only to authorised users via the internet. It's often vital for finding and returning lost pets. In some states of Australia, the microchipping of pets is compulsory. If your pet is not microchipped, please give us a call to make an appointment to have one inserted. If you find a lost pet, please take it to a vet for a microchip scan, so that we can re-unite the microchipped pet with its owner.